Today we have a post from SparkFun Engineer Chris Taylor on "Self Taught Electronics." More and more these days, I am meeting people who have built complex, impressive, and clever electronic projects, and, when I ask, I'm surprised to find out that they have no formal engineering or technical education. Now, I'm not surprised because I don't believe that electronics can't be learned outside of a university, a good deal of my job is to try to teach electronics outside a university. I'm surprised because, more often than not, this impressive project will include a design element, component, or concept that I doubt I ever would have been exposed to had I not attended college. How do people learn a complex subject, like say, fourth-order filters, on their own time? I am always blown away by the fact that people have mastered concepts, on their own, that I had never even heard of, let alone attempted to study, before I had the dreadful feeling of finding out that it was one of my required college courses. Where are these people getting this information?! How did they manage to find such a (sometimes) very dry subject and keep themselves engaged long enough to master it? I ask these questions because I'm jealous. I'm jealous of artists and designers that were exposed to this field at a young age. I'm especially jealous of those lucky people who manage to find just the right book, or mentor, or resource to teach them and keep them engaged in a subject that, in college, I paid a boatload of money for someone to teach me. So I started asking around. I asked my fellow engineers, friends, and autodidacts what helped them. A good deal of electrical engineering isn't taught in school, it's taught in the field or researched independently. I asked my colleagues what helped them learn when they were learning on their own. If one wants to learn electronics, at home, on their own, how does one do it? This is what I came up with. 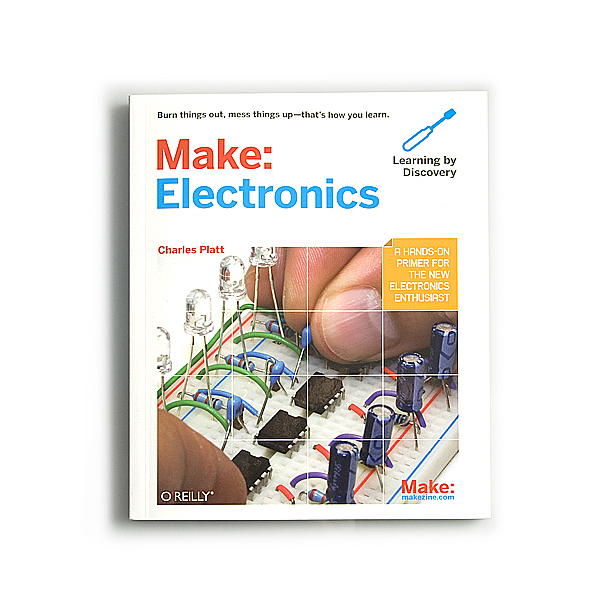 The Art of Electronics is a must-have for every electronics enthusiast. It has become a bit out-dated (especially in the microcontroller department) but I use it all the time for reference or just a refresher course on a concept. The Forrest Mims books have been teaching beginner electronics to kids and adults for decades. This is the first electronics book I ever got my hands on. 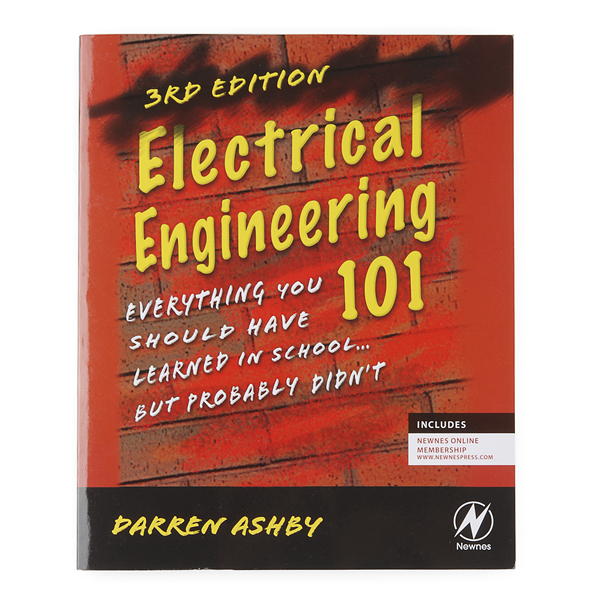 Electrical Engineering 101 explains electronics in a more "plain English" way, and is great if you're coming from a more mechanical background. Make: Electronics is a great start for hobbyists of any age. There are more and more free online courses popping up every day. In many cases, one receives the same info that a paying student would get, all online. CourseRA has lots of electronics-related courses, all for free. There are also, of course, plenty of online tutorials for just about any electronics concept you can think of (shameless plug for learn.sparkfun.com). There is just no substitute for experience. No school can exactly prepare you for a job in electronics. No amount of theory can prepare you for when the amplifier you just built suddenly decides to start demodulating FM. Experience is gained through doing as many projects as you can-- always tackling a new challenge and dealing with the inevitable problems it presents. Even if you fail, the lessons learned from that failure are more valuable than anything you would have learned from a book. This is another form of experience. Obviously it's great to have someone around who already has the experience that you are trying to build. They can save you a lot of frustration and time. But what's more important is to learn how to use mentorship. I used to think that I didn't have any mentors, that I was on my own. But with experience, I realized that I had mentors, I was just too proud to ask questions. Once I started asking questions (even dumb ones), I found that everyone can find people to help them along the way, one just has to ask. So all your self-taught - or self-evolving - electronic tinkerers - what are your go-to resources? 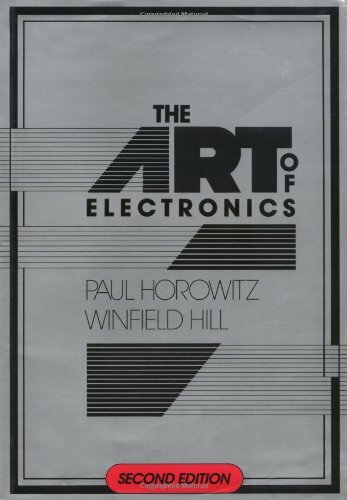 I've never found a copy of "The Art of Electronics" form less than $100. It's one of those books I hope to come across in a bargain bin somewhere. Another book that's great for kids is "Getting Started in Electronics" by Forrest Mims. I picked up a copy of that at Radio Shack when I was in grade school and never looked back. I still have it! Both My Yellow and Green Forrest Mims books from Radio Shack were so well used they finely fell a part after 20+ years. I always got a kick out of seeing the Yellow one on some one's desk at some major company. Please add Charles Petzold's 'Code' to your book list!. This is one of those marvelous 'Roseta Stone' books that should be in every library. I agree. 'Code' springboarded me back into electronics. I did have a 25 year old EE degree but it was theoretical (and fading in my memory) that I have had to learn the practical stuff, mainly from tutorials here, Adafruit and a lot of other internet places. I'm self taught, but I find "self Taught" to be a misnomer. More accurately, people that are "self taught" are inquisitive and purpose driven. When I was doing electronics, there was no internet. You had data sheets and application notes that you got from your distributors. That was my primary resource... I would find all the parts that were associated with the puzzle I wanted to solve, then get and read the literature on them. That would often, bread crumb style, lead to a subject I would need to master to solve the puzzle. That would usually entail having to go out and find a book on the subject. It's all about the puzzle. If you want to solve the puzzle, need to solve the puzzle, and are not afraid of the puzzle, then you are "self taught". Nowadays, everything is on the internet! It's a great time to be a puzzle solver... er, "self taught." In the beginning - just about anything printed by Don Lancaster starting with the TTL Cookbook. I'll second that. Lancaster's books were phenomenal! An excellent source is the Navy Electricity and Electronics Training Series NEETS. And, they are a free download. I third NEETS books, especially if you have any interest in any kind of Tube circuits!! Agreed, the NEETS modules are very handy for basic learning. It helps that they are broken up into discreet topics, so you can skip the ones you don't need at the time. I think I still have a hard-copy set of NEETS modules in the basement somewhere from youth. My answer is to stay curious and do projects on your time while you can. Even reading about other projects help. This is what helped me persevere through school, because seriously, the subject is very dry in academia. Worse yet, a past internship and my current job (recent college grad here in EE), a lot of it is just documentation and testing, very little design work. My advice, keep on doing projects and learning the electronics you love to do. For those of you pursuing a degree in it, you might be stuck with office politics and project boredom. Don't let this get you down, keep doing what you love on your spare time and you will remain happy in the field of electronics. And most importantly, you'll learn more. Still need the degree to get most jobs in EE. That's what you're paying the $250,000 for, not the knowledge. That, and in case you are one of the unfortunate few born without enough calculus to do LaPlace Transforms, Bode plots, and numerical analysis, or read "The Art of Computer Programming" at age 5. Fact is, in many states in the US you can not call yourself an Engineer without being bondable and passing tests or being a member of a recognized society. Like passing the bar without law school, pretty tough without a formal education. "No amount of theory can prepare you for when the amplifier you just built suddenly decides to start demodulating FM." Everyone who's ever built a guitar effects pedal on a breadboard knows exactly what he's talking about right here. I caught an interesting interview through my bass amp while building a fuzz/octave pedal just the other day. This is my favorite, it's an absolute goldmine of application knowledge. SparkFun... I felt that this article was directed to me! Learning electronics is non-linear and very much intuitive for me... I find the undeniable logic compelling and something that I'm starting to visualize... with the help from your tutorials. Sometimes I get more information from your product reviews... awesome! Thanks for the book list and all the helpful resource information... (I never know which one will make scene to me.) I just posted a new page on my web site that kind of addresses how I approach learning. "It's just remembering what interests you"!! "12 Degrees of FREEDOM"... Concept and Form... must see! www.dslstudio.com/12degfreedom.html Thanks SparkFun! I was a sophomore in high school and my biology teacher assigned us to write a paper on something or enter a project in the science fair. That choice was real easy for me I would enter the science fair with a project. I wanted to build a laser (circa 1962) needless to say back then I couldn't come up with a front surface mirrored ruby crystal. But with a copy of the American Radio Relay League handbook - www.arrl.org I was able to cobble together a tube amplifier that was strong enough to modulate a light bulb when I spoke into a microphone. Thus starting me on my way through CU's EE program and a career as an engineer. ALWAYS persevere I guarantee you will learn something. Want to learn some analog? Maybe make a biomedical instrument? If you run across a copy of this, get it! Read it and add a little common sense up to date thinking with Arduinos and Delta/Sigma converters and modern great low cost op-amps. "How to Build and Use Electronic Devices Without Frustration, Panic, Mountains of Money, or an Engineering Degree". There is a second edition, 1980. Try for that one. If you don't like it I'll send you a free thing - my choice of thing. This would be a great project to update. Also, if you want to see what people did before bicycle helmets and when you could buy all the components and fuel for an amateur rocket at the hardware store, check the libraries for a copy of "The Scientific American Book of Projects for the Amateur Scientist" and build a basement vacuum system and atom smasher. You can also X-Ray yourself as often as you like. This book really inspired a generation. You and all the other engineers and non-engineers taught me so much while I was at Sparkfun, thanks for putting up with all my silly questions, I wouldn't be where I am today without all that help. Those old Radio Shack electronics kits, I had 3 or 4 of them and when I exhausted all of the projects in the books I started making hybrid projects adding jumpers between the kits and making more complex circuits than those in the books. At an older age, joined the Navy and gained some formal training. The NEETS modules previously mentioned are great as well. I suspect that they are somewhat dry to just read through start to finish, there aren't really any 'projects' in them but they're great reference material and a good source of free knowledge if you're driven to look something up and learn about it. I started with a radio shack 200 and 1 project kit and occasional help from my dad. 40 years later I find a generous mix of experimentation, books you all have mentioned, SparkFun and similar tutorials, forums(!!) help me to do what I suppose should technically be beyond my skill level. I think it helps to occasionally build simple circuits, try to use math and various math models to predict how they should sort of behave, then try to measure how they actually do behave, tweek them and see how the circuit was affected, try to graph or otherwise collate the results reasonably. That's sometimes a bit tedious, but I've found often offers insight into why things might not always match up to what I expected. If you really want to learn something, try writing documentation that explains what it is that you've built, how it works, and how to use it. I find that writing docs makes me go back and make things better, as I have to explain why I've done what I've done. I always self-teach myself new things. I spend many times at night just reading tech docs just for fun. However, I tend to learn more when I help mentor people, mostly with FPGA development. If anyone wants to learn more about FPGA dev (specific to Xilinx parts), let me know! One thing that is worth noting in the mentorship section is that not only learn from having mentors, but also being a mentor to others. I'm still a fairly young engineer, but I've had a few engineers straight out of college work around me, and answering their questions actually forces you to improve your knowledge base quite a bit. "Practical Electronics for Inventors" by Paul Scherz is one of my favorites. A lot of the examples compare electronics to mechanical things. For example, section 2.3.5 is titled "Water Analogies" and explains voltage using a water pump and pipes. I second. This is my first reference usually. I think one of the best sources of diy education comes from other people's projects and tutorials. It's a big world out there and usually someone has already built something that uses the same elements that I want to use for projects. When they share their documentation you can study the designs, learn from their mistakes, and build upon what they've done (even if the end result is totally different.) Instructables.com is of course one of my favorites! I use lots of online tutorials (and the SparkFun tutorials are VERY well written), and I spend a lot of time combing YouTube. There are a lot of really bad presenters on YouTube (and almost nonexistent 'editing'), but every once in a while, someone explains a concept in their own way and it suddenly clicks for me. For example, I once watched a video where Jon Titus explained how to create driver circuits for LEDs and he was just brilliant with his explanations. Sadly, those videos have since disappeared from YouTube. I also purchased the Forrest Mims "Engineer's Notebook" series and a lot of the books from Make. (Eagerly awaiting their Encyclopedia of Electronic Components Vol. 2.. due next month, I think). I was remiss in failing to cite "Lessons in Electric Circuits" free textbooks at http://www.ibiblio.org/kuphaldt/electricCircuits/. I had a basic 1-semester electronics class in high school (which went as far as darlington pairs of transistors), and then I didn't get back to electronics for a few decades. I got back into it by downloading and reading the textbooks that I just mentioned, and I felt that my understanding was greatly enhanced afterward. Not just an understanding of how to make basic circuits, but a thorough understanding of the basics of electricity and how to use it safely. While this may not be the kind of resource you are discussing, I felt I had to mention the wonders of trying stuff out. I have found (personally) that one of the best learning tools you can give yourself is the opportunity to actually work with the technology. Learning about op-amps? 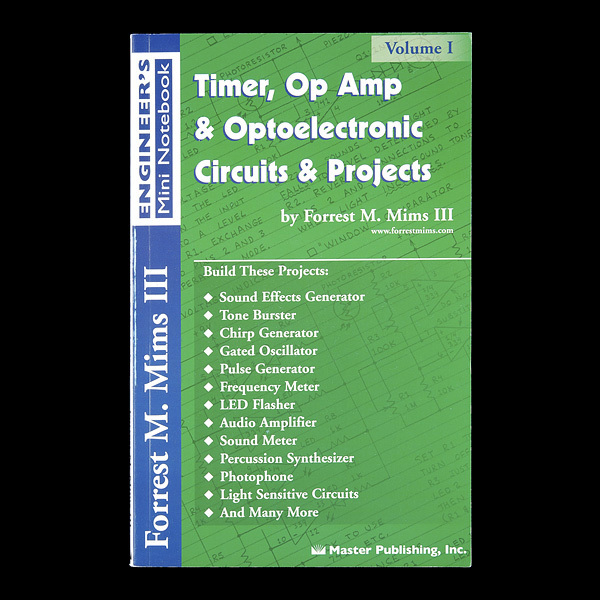 Grab a Forrest Mims book, look them up on Google, then just plug some real op-amps into your bread board, and see what you can do with them. I've found it works for almost every topic. App notes, THIS WEBSITE, and a little thing called google.